The Post-Exilic Books of Ezra, Nehemiah, Haggai, Zechariah, and Malachi were written about the period between 537 and perhaps 430 BC. The themes are returning to Jerusalem after the Exile, rebuilding the temple, restoring the wall, and then learning to walk before the Lord with sincerity and purity. Of course, these books seem pretty obscure to the average believer. 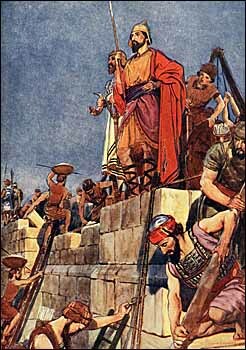 As a boy I was impressed by a Sunday school illustration of people celebrating the restoration of the wall of Jerusalem under Nehemiah -- thousands of people marching on top of the new wall! You've probably heard some tithing sermons from Malachi -- "God will open the windows of heaven." But perhaps your familiarity ends there. Some people would tell us that these books aren't very important. Only the New Testament is important, they say. Wrong! Jesus himself quotes from Zechariah and Malachi. These five books have been revered as the inspired Word of God for more than two thousand years and contain vital nuggets of truth that God has for you and me. As I've been pouring over these books for the past half year I'm beginning to see how important they are. This is our 44th online Bible study since 1996. If you've participated in one before, you know how God can use them in your life. If not, then you have a treat in store for you. This is an cross-denominational study designed to help you grow as a disciple of Christ. -- Dr. Ralph F. Wilson. About the leader. How God changes the heart of kings to bless His people (Ezra, Nehemiah). How to handle the enemies -- both physical and spiritual -- who hinder the rebuilding of the Temple of God in Jerusalem and in our hearts (Ezra). Why God withholds his blessing, and why he restores it (Haggai). Messianic promises of Christ's glory in the temple (Haggai). How God uses prophets to encourage, motivate, and correct his people (Haggai, Zechariah, Malachi). Why we shouldn't despise the day of small beginnings (Zechariah). Messianic prophecies of Jesus entering Jerusalem on a donkey, "the one they have pierced," the 30 pieces of silver, the "cleansing fountain," and striking the shepherd that the sheep are scattered (Zechariah). Nehemiah's faith, managerial wisdom, and spiritual toughness to complete God's assignment (Nehemiah). The amazing feat of restoring the broken wall in only 52 days -- amidst heavy opposition -- and the importance of building protective walls in our lives to guard God's work in us (Nehemiah). The amazing spiritual revival of Ezra's day (Ezra). What happens when believers marry unbelievers (Ezra, Nehemiah, Malachi). Finding the joy of the Lord as our strength (Nehemiah). Spiritual lessons on purity of heart in worship and giving to God (Malachi). Prophecies about John the Baptist -- the Messenger of Yahweh (Elijah who is to come) -- and Jesus, the Messenger of the Covenant, and the Son of Righteousness who rises with healing in his wings (Malachi). I'm particularly interested in spiritual lessons that we disciples of Jesus can apply to our lives to help us grow. These books are chock full of lessons for disciples, which I'll summarize at the end of each lesson, as well as highlight in the discussion questions interspersed in each lesson. I encourage you to sign up for this study today so you don't forget -- and invite your friends to do the same. If you sign up now, you'll receive your first lesson this coming Friday. There is absolutely no charge for these e-mail lessons.